James Pulham and Son were awarded their first Royal Warrant in 1868 for their work in the grounds of Sandringham Royal Estate. HRH Prince Edward – the future King Edward VII – commissioned them to re-landscape the gardens according to the design of William Broderick Thomas, the Head Gardener, which involved moving the original ornamental lake, and creating two new ones in its place. 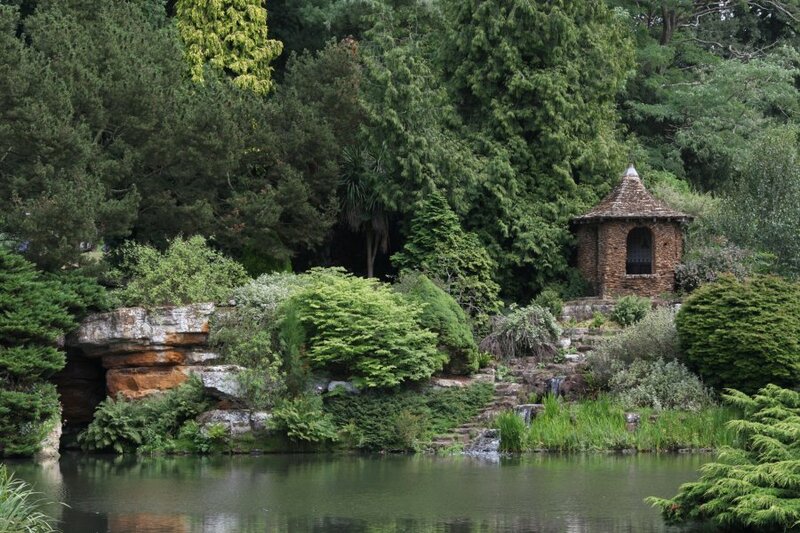 They constructed a ‘Waterfalls, rocky stream, and cave for boat house’, and returned in 1905 to construct the Walled Kitchen Garden, and build a small summerhouse – called ‘The Nest’ – on the shore of the main lake. A full description of the work done by James Pulham and Son at Sandringham – together with a number of pictures – can be found in Chapter 8 of Rock Landscapes: The Pulham Legacy – the critically-acclaimed and lavishly illustrated definitive story of the lives and work of James Pulham and Son. Written by Claude Hitching, with featured photography by Jenny Lilly. Published by Garden Art Press. Posted on August 24, 2014 June 26, 2016 by Claude HitchingPosted in Book ContentsTagged 'The Nest' Summerhouse, . . James Pulham and Son, Boat Cave, Claude Hitching, HRH Prince Edward - later King Edward VII, Jenny Lilly, Rock Landscapes: The Pulham Legacy, waterfalls, William Broderick Thomas.